Thinking about Tower Bungee (Bungy) at Pokhara Nepal? Pokhara has become the heaven for extreme sports lovers. Tower Bungee (Bungy) at Pokhara Nepal which is also known as Water Touch Bungee is the latest addition to its thrilling adventure sports. 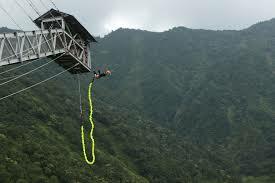 This is the only second bungy jumping site in Nepal and it is the first to offer bungy from tower. The Last Resort was the one who introduced bungee in Nepal from the bridge in Bhotekoshi. But Bungee jump in Pokhara is different from bungee jump in Bhotekoshi in a way that Bungee Jump in Bhotekoshi is done from the suspension bridge while the bungy jumpers dive from 70m high tower over the pond. This is the highest water touch bungee in the world. Tower Bungy jumping in Pokhara is organized by High Ground Adventures. It is also the owner of Nepal’s first skyzip services. Several test jumps were carried out for number of days to confirm about its safety precautions before opening this tower for the public. Tower bungy was officially opened in 22nd September 2014. Choose from bungy package and swing package. After taking the jump, the jumpers are picked up by the boat and the men on boat will remove the cord that is tied to the jumper’s body. Be there and experience 70 m vertical drop in just 3 seconds. Not only do you get a high quality and International Standard bungy cord but you will be taught the basics dos and donts of bungy by an European instructor Larish Melkars who has several years of experience in this field. He will also tell you how much weight is required for bungy jump before approving the jump. The splendor of mighty mountain welcomes you as you make the free fall. According to the company, the capacity of this bungy tower is approximately 40 person in 1 day. March, April, September, October and November are considered best months for bungy jump from tower. The tower bungee cost is different for Nepalese and for foreigners. Nepalese people can do tower jump at a price of NRs 3,490 per person per jump while they are charging NRs 6,890 for foreigners. They remain open seven days a week. You can also choose the combo package that includes Bungee and Zip Fly. The combined package costs NRs 5,490 for Nepalese and NRs 9,990 for foreigners. The cost excludes charge for video and photographs. You can not get your money back if in case you do not want to take a jump after reaching to the top of the tower. So , pay for the expenses only if you are determined. A drive of 20 minutes from the Lakeside will take you to the grand bungy site location which exists in the beautiful Hemja where you will be surrounded by the captivating vicinity of green hills, lakes and mountains. It lies near to the Tibetan Refugee Camp at an altitude of 80 m from sea level. What are other similar adventure sports available in Pokhara? You can try paragliding, ultraflight, zip flyer, rock climbing, sky diving, high rope, canyoning, kayaking and water ball in Pokhara. There are several travel and tour operators who are organizing tower bungee (bungy) at Pokhara Nepal. You can also go there independently. Bunjee Jumping is my great hobby to do that.